AASU wouldn’t allow the evil designs of the BJP to destroy the cultural and linguistic identity of Assam by engineering fratricidal violence. North Lakhimpur district unit of AASU unit effigies of Chief Minister, Sarbananda Sonowal and state BJP president Ranjeet Dass. Image: Northeast Now. The North Lakhimpur district unit of All Assam Students’ Union (AASU) burnt effigies of Assam Chief Minister Sarbananda Sonowal and state BJP President Ranjeet Dass on Monday protesting physical assaults on students’ body’s members by BJP workers at Nalbari on Sunday. 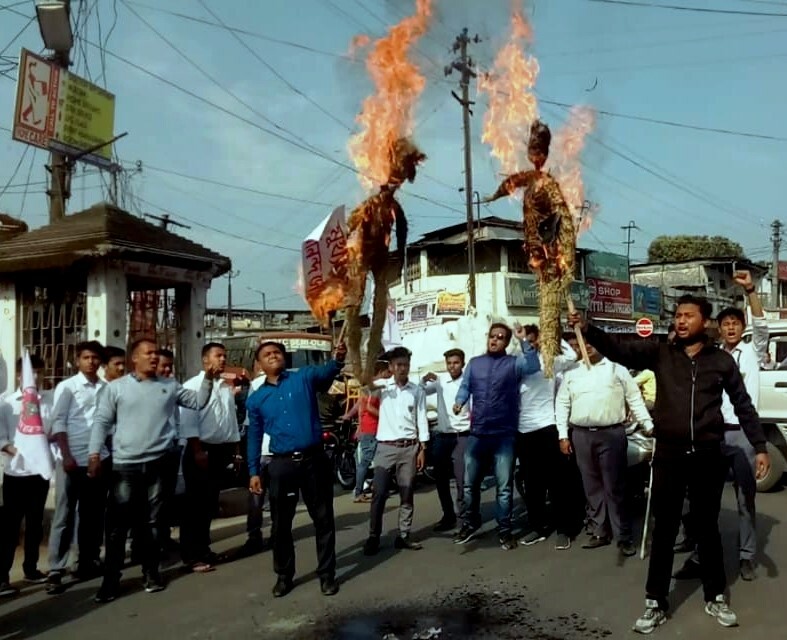 The slogan-shouting AASU members of North Lakhimpur burnt the effigies of the Chief Minister and the BJP state president accusing them of indulging in politics of communal hatred and division. In a statement the president of North Lakhimpur district, AASU Pranjit Gogoi and Secretary Poonamjyoti Burhagohain condemned the incident of assault on AASU workers by BJP members at Nalbari. They said that AASU wouldn’t allow the evil designs of the BJP to destroy the cultural and linguistic identity of Assam by engineering fratricidal violence. The AASU leaders reminded the Chief Minister, Sarbananda Sonowal of his past works for defending the interests of Assamese. They urged CM Sonowal to be on the side of the public in opposing the Citizenship (Amendment) Bill 2016 or otherwise he would be remembered in history as the all time power hungry and selfish chief minister of the state.